Named ‘Solo Instrumental Discovery’ at the Victoires de la Musique in 2014, the French violist Adrien La Marca has spent two years preparing his first recording. 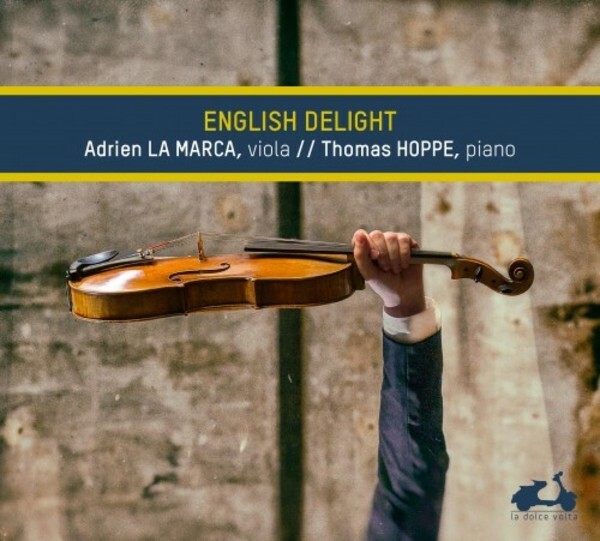 The album 'English Delight', a tribute to the viola music of English composers, presents an outstandingly lyrical programme blending different registers, periods and styles. Adrien La Marca invites us, with Thomas Hoppe, an incomparable musician and chamber partner, on a journey through four centuries of music, from Dowland and Purcell through Vaughan Williams, Bridge, Clarke and Britten to Jonathan Harvey. Though these English composers naturally show mutual influences over 400 years, they offer a wide range of musical languages, all equally sublime. Each of the pieces is linked to a special moment in Adrien La Marca’s artistic itinerary. To add to the pleasure he has had playing them in concert, he is delighted to have been able to bring them together for the public on this disc.